Local Internet Marketing Case Study Update for "Phoenix SEO"
So we actually hit the first page for “Phoenix SEO” on Jan 31st, 2011 about a month and half after our case study where we thought it would be about another 4 to 5 months since the competition is fierce. But it only took about 5 months total. Our main goal for this was to test our SEO skills and build a case study for our sales calls with clients. There are sites on the first page of Google for “Phoenix SEO” that have been around for more then ten years and have over 50k backlinks. We respect our competition and we still haven’t hit any position higher then the 5th spot but we also happy with our work so far. This is where it’s going to get interesting because after this post we are going to do a test again. We noticed with really no link building effort on our part with the anchor text local internet marketing we went from 35th to 17th for “Local Internet Marketing” which really was the whole reason we created this brand. We love local online marketing and have been in the game since 03′ as local internet marketing consultants for local job boards, online automotive classifieds, and local PPC management companies. Also, it captures more of what we do since we don’t just focus on SEO alone. And especially with Google taking into consideration Social Media signals the SEO game has become more holistic and link building is more like an investment portfolio. We actually prefer to have a new client start out with a new small business website that we build on WordPress with a killer Phoenix web design, conversion triggers, and Google Adwords Pay Per Click Campaign we can manage for them with call tracking and recorded calls. This gives us a better idea on what we can focus on for them on their website we manage that will help build brand equity, get online exposure, and convert into new sales. 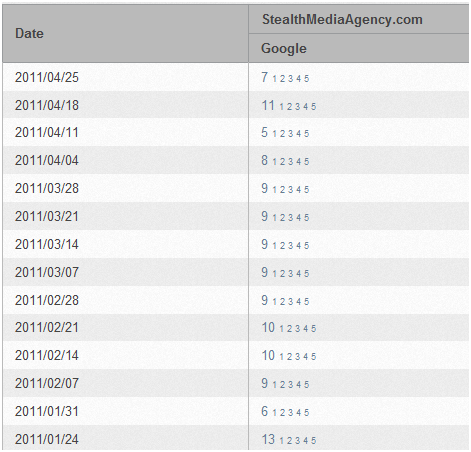 Let’s see what happens when we take out “Phoenix SEO” from our site title. We will do another post in the future to give you an update on our testing and results. Luckily, our model isn’t a “numbers” game and we work with an exclusive base of clients and do not accept new clients all the time.